You young people should be proud of us as we have gone technological in the 21st century. It sure took the junior elves a long time to get us into the 21st century. And my, how the Internet has been so helpful in determining who’s been naughty and who’s been nice. You probably came to this site because you had a chance to have a personal experience with us out on the streets of Utah. It means so much to us! Since 2010, we have visited many places throughout Utah, including Temple Square and at the Pioneer’s Day Parade that happens each July. Mrs. Claus doesn’t mind as long as we get home to the North Pole by 10 p.m.! 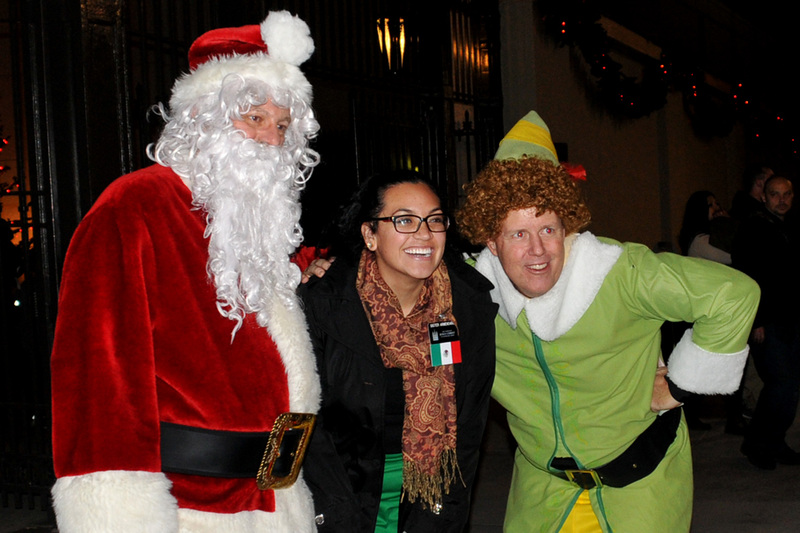 We’ve heard it said that people come to Temple Square during the Christmas season to see the lights. Balderdash. You know as well as we do that you’ve come to see us! We’ve been part of thousands of family pictures, celebrations after engagements, birthday and anniversary congratulations, and so much more. We’ve given away thousands of dollars in tip monies to many wonderful causes. 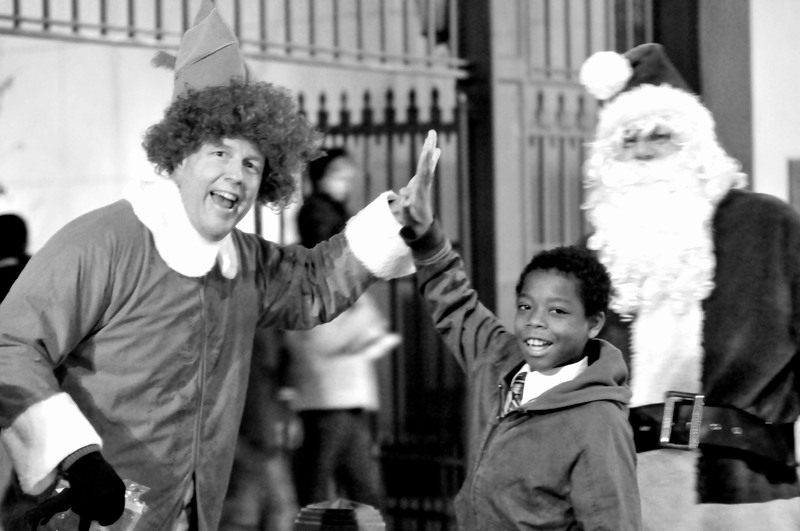 And we have loved every minute of spreading cheer to tens of thousands of people. You might be curious, why do we come to Utah every Christmas season? After all, doesn’t staying home at the North Pole and getting ready for Christmas Eve under the watchful eye of Mrs. Claus sounds like it would be a better use of time? 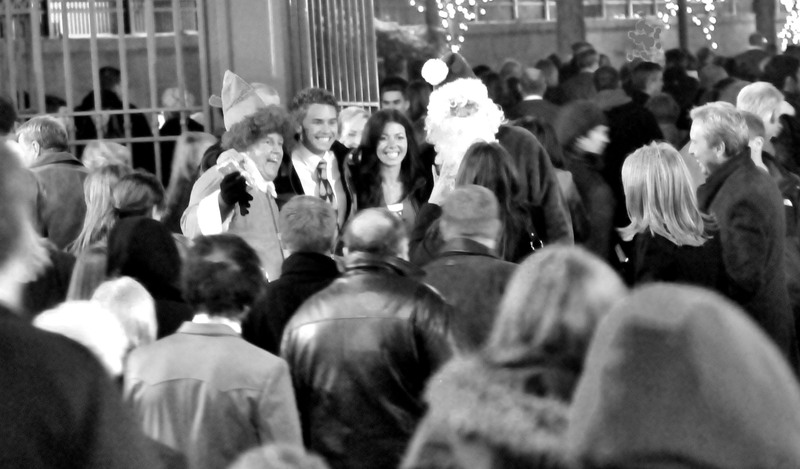 Well, our goal is to spread Christmas cheer and bring smiles to the faces of everyone who interacts with us. It brings us such joy to share in the excitement of so many who love (as we do) the Christmas season, a time of giving and for everyone to enjoy this special time of year. 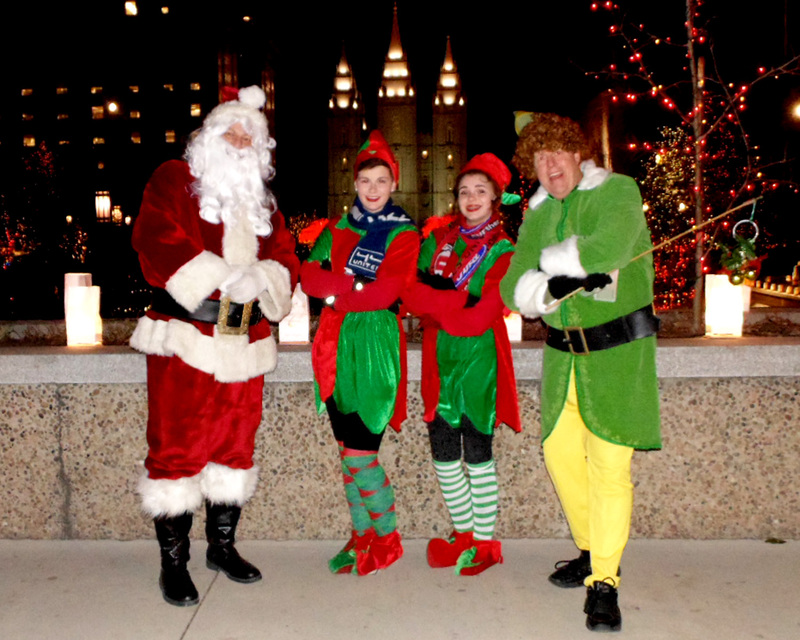 Honestly, we probably have more fun than anyone by traveling to Utah from the North Pole. You people really do make our season bright! Who else is involved besides Buddy and Santa? 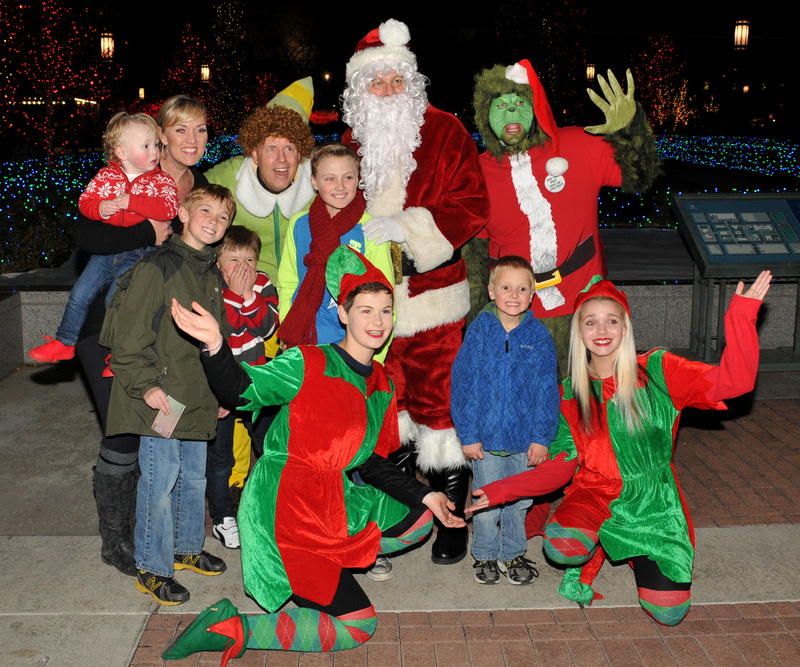 Throughout the season, we have others with Christmas ties come with us, including Mrs. Claus, The Grinch, and an assortment of junior elves, straight from the North Pole! Where do the tip monies go? We are big supporters of the Salt Lake Rescue Mission. Each year we purchase dozens of coats, gloves, scarves, and other warm clothing. This donation is very important to keeping the homeless warm during the upcoming cold months. In addition, the mission has a program that is intended to get the homeless off the streets. For several years we have taken those belonging to this special program to Salt Lake Bees and Utah Jazz basketball games. Besides the tickets to the game, we provide snacks so they can have a great time (they don’t get to do many things like this!). It’s a great activity and everyone has a wonderful time. It’s a night out for those who are working hard to become productive members of the Utah society, so encouraging them in this way is just awesome, much better than hugging a raccoon.. In addition, Buddy and Santa make an annual appearance at the mission the week before Christmas, handing out about a hundred snack packs to those who are there that night; each pack includes hand warmers, candy bars, breath mints, and other fun items along with a Christian tract and a million dollar bill. Each year we adopt at least one needy Salt Lake City family, typically one that is headed by a single parent. (In 2017, we adopted four families!) The eyes of the children light up when Buddy, Santa, and the elves come to their home just a few days before Christmas and Santa has a bag full of presents for the children and even a little something for Mom or Dad. There are many families who struggle during this time of the year, so it is our privilege to bring some joy at Christmastime. For several years we have had the chance to distribute presents at the Ronald McDonald House in Salt Lake City Christmas Eve. This wonderful place allows the families who have a child in the children’s hospital to stay close by. We have also been able to hand out turkeys at the Pregnancy Resource Center located in Salt Lake City. And we’re always open to new ideas. To see some pictures at the charity events we have sponsored along with a video from the Ronald McDonald House , click here. Do you know the “Three Laws of the Elves”? Or can you list the 4 food groups, according to Buddy. To check this out and see more pictures of Buddy and Santa, click here. Now that we’ve told you a little bit about who we are, let’s talk about the real reason we’re here. Every person ought to consider the purpose of life. Are humans just the result of a cosmic accident? Do we just live for such a short time before turning into dust? Or… is there something more to life? I think it depends of your spiritual beliefs. If you have a religion, it provides the answer. But if you don’t believe in a god, the question contradicts your thinking. Having a reason implies having a purpose, which indicates an intelligent being for cognitive power with intent. That’s what people call a god. So if you don’t believe god exists, you can’t believe a reason exists. You must settle for assuming we got here through some natural process, and that’s that. True or False? According to the Bible, every person who is born is guilty of sin. True or False? It is possible for you to stop sinning in this life. True or False? God accepts you only when you are able to stop sinning. True or False? Only by good works can you earn God’s favor and hope for Heaven. True or False? It is possible for you to know that you have eternal life. According to the Bible, every person who is born is guilty of sin. True. The Bible says in Romans 3:23 that everyone has sinned and has fallen short of God’s glory. The wages of sin is death, Paul added in Romans 6:23. Because you are imperfect and God is perfect, you are unable to enter into a relationship with the Maker of the universe if you are stained with sin. It is possible for you to stop sinning in this life. False. Many people believe that it is possible to stop sinning. Unfortunately, each one of us is human and is prone to sin. Do you ever struggle with obeying your mother and father? Disobeying your parents is breaking the Fifth Commandment. Is it possible you might hate someone in the future? Jesus said hate is the same as murder. Ever get tempted with lust for another person? Jesus said that, when this happens, it’s the same as committing adultery. Who could ever measure up to such standards? Even the apostle Paul said in Romans 7:7-25 that he, just like all Christians, struggled with sin. God accepts you only when you are able to stop sinning. False. Honestly, who do you know that has stopped sinning? If you know such a person, please tell us so we can meet him or her. Even the Pharisees, the most religious and self-righteous group in Jesus’s day, were guilty of sin because of their pride. Outwardly, they made it appear they were doing just fine, but Jesus said they were guiltier than the lowest sinners around because, inside their souls, they were dark and dirty. Only by good works can you earn God’s favor and hope for Heaven. False. How many good works will it take to rid yourself of your sinful condition? One righteous act? Five? Five hundred? Actually, the prophet Isaiah clearly said in Isaiah 64:6 that “all our righteous acts are like filthy rags” in God’s sight. Perfection would have to be achieved. How can we achieve something that is actually impossible? It is possible for you to know that you have eternal life. True. Despite our sinful condition, the Bible says you can know beyond a shadow of a doubt that you are forgiven, loved, and accepted by God. That last question might have thrown you for a loop. After all, is it really possible for a sinful person to know that a relationship with God is a possibility? The answer is YES. First John 5:13 says “you may know that you have eternal life.” God’s desire is for YOU to have a personal relationship with Him. If you were to die right now, do you know that you will be forever in God’s presence? Consider a few verses from the New Testament to help illustrate the point. Fact 2: Deserved Punishment. Everyone deserves eternal death and separation from God forever because of this sin. Fact 3: Christ’s Sacrifice. Having a relationship with God is the only way to deal with your sinful condition.Romans 5:8 says, “But God demonstrates his own love for us in this: While we were still sinners, Christ died for us.” It is all centered on what God did for us, offering us forgiveness when we allow God to come into our lives. Fact 4: God’s Grace. We can’t earn God’s favor through our good works. Ephesians 2:8-9 says that “it is by grace you have been saved, through faith—and this not from yourselves, it is the gift of God—not by works so that no one can boast.” Grace is like receiving a birthday present. A person who would dare ask, “How much did that present cost?” while pulling out a wallet to pay obviously doesn’t understand what a gift is all about. Fact 5: Your Belief. Romans 10:9 says “that if you confess with your mouth ‘Jesus is Lord,’ and believe in your heart that God raised him from the dead, you will be saved.” Two verses later, Paul quotes from the Old Testament, adding, “Anyone who trusts in him will never be put to shame.” God has made it clear that we can receive this gift of salvation and become a new creation in Christ (2 Cor. 5:17-18). All we have to do is want it. Despite your sin, you can be forgiven of all your sins—past, present, and future—because of what God has done. When we grasp the truthfulness of this, we can then “know” that we have eternal life. Have you “Got Forgiveness”? You might wonder, what about good works? Aren’t they important? Believers who understand the price that was paid for them will want to do good works. As Ephesians 2:10 says, we are “God’s workmanship created in Christ Jesus to do good works.” We do the works because of, not for, our salvation, provided by the sacrificial work of the God of this universe. So while we don’t want to minimize the importance of good works, we must tell you that it’s impossible for a sinner to gain God’s acceptance by doing them because you can never be good enough. Check out the following sites! How can a person get into heaven? Do Christians believe they can say a prayer and then sin like hell? Is it possible to choose salvation after death? Does God want people in hell? How much trust should be put into a religious experience? What key arguments are there for God’s existence? Doesn’t the fruit (good works) produced in Mormonism prove this is the true church? Mormonism Research Ministry: This site deals specifically with the religion of Mormonism from a Christian perspective. Done in love and with a desire to politely show the important differences, with plenty of articles on a variety of topics, YouTube videos, and Podcasts (Viewpoint on Mormonism) that airs 3x each weekday on 820 AM. Carm.org: An overall apologetics website dealing with a variety of topics, including atheism. To see some pictures at the events we have sponsored, click here.